Ever wonder how to consistently eat real, healthy, gluten free, grain free, dairy free, clean eating food on a daily bases? Me too. I mean, I did when I first started. I tried meal prepping for hours one day a week (great for one person, but not as plausible for a family). I felt like I blew an entire day on shopping, washing, chopping, sorting, mixing...and then I had to do it all over again 6 days later! If that works for you then stick with it and more power to ya. I found that even though a frozen slow cooker meal comes in pretty handy on busy nights, what's even better is a handful of quick (30 minutes or less) meals with enough for leftovers. Those leftovers are better than a day of meal prepping to me. I can take leftover meat, quinoa, veggies, sauce, what have you, and recycle it into other meals throughout the week. If you're thinking it sounds too complicated or you just aren't imaginative enough find something new to do with leftovers, then have some simple ready to use items that will make it easier. My go-to's are my favorite spaghetti sauce, curry sauce, and Seasoning blend. Here's how I recycle healthy meals throughout the week for my family of six. Like most of us I usually start the week off with enough energy and enthusiasm to at least spent a little time cooking a meal, but by the end of the week all I can think is, "What? You want to eat again? I fed you yesterday!" My meal recycling method ensures everyone gets fed (everyday) and food doesn't spoil quite so often in the back of the fridge. Monday is usually a meatless meal. This time it was Tomato-Basil Soup with Gluten Free Bread which I had made over the weekend. (I used the garbanzo/fava bean blend instead of rice flour.) I also blended the soup up so it was nice and smooth and creamy. Simple one-pot- let-it-simmer soups are no brain-er's. I had a bowl of chopped fruit salad and threw some carrot sticks and broccoli in a bowl on the table to round things out too. Here's my simple Cole Slaw recipe converted from the original KFC dressing recipe: 1/3 cup almond milk, 2 tbsp. 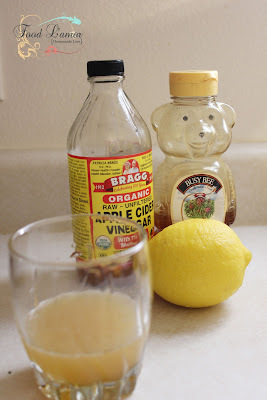 apple cider vinegar, 2 -3 tbsp. honey, 1/2 tsp. sea salt, 1/8 tsp. pepper, and 1/2 cup Just Mayo brand (gluten free, soy free, and egg free). Whisk together and pour over shredded cabbage, carrots, and green onions. I'm losing steam by Wednesday. I've still got enough in me to bake some sweet potatoes/yams and dump some of the Maya Kaimal brand Coconut Curry or Vindaloo sauce over some veggies and chicken. Let it simmer away while the potatoes bake in a 350 degree oven for about 35 - 45 minutes. I like to add some extra coconut milk to the pan to make the sauce go a little further. It also makes it a little more mild in the spicy department, which is nice for the kids. Alright, I'm spent. Today the 3 or so cups of leftover Tomato Basil Soup from Monday becomes the base for a Quinoa e Fagioli Goulash. I browned up some organic ground beef with a 1/2 cup of chopped onion, then poured the soup over top. I had about 1 1/2 cups of the quinoa from Tuesday left which I added to the soup, along with about a cup of broth, and frozen veggies (such as green beans, carrots, and peas. I also drained and rinsed a can of white beans and dumped them in, as well as a can of drained diced tomatoes just to be sure. A quick salad and dinner is done. I only use 1/2 lb. of meat in the goulash (or less), but I still cook up the whole package and store in the fridge for another meal. Thank goodness it's Friday! I've gone from motivated to moaning at dinner time. The best I can do is spaghetti. If you're keeping it gluten free and grain free then cook a spaghetti squash (here's the best way I've found to cook it). If you're really done, just stab the squash a few times like a potato and cook in the microwave for around 8- 10 minutes. Cut in half and scoop out the seeds before scooping out the spaghetti-like squash noodles. While it's cooking, heat the leftover ground beef (or if I wasn't too frazzled on Thursday I might have thought to roll the ground beef into a meatball and cook it, but there's no guarantees) along with a jar of your favorite spaghetti sauce. Pour the meat sauce over the spaghetti squash noodles. Got leftover salad? Set that on the table too. If I still have leftovers by Saturday then I am going to do everything I can to use them! Saturday can be just as busy if you've got kids in sports or are just trying to catch up on all the things you didn't accomplish during the week. So, I look at my leftover inventory and with the fish fillet, sweet potato, and 1 cup curry sauce left I think I've got enough for a revival of the Poached Salmon Indian Curry. Add another can of coconut milk to the leftover sauce, plus 2 -3 cups of vegetable or chicken broth. Make some more quinoa or if you're good with rice then start steaming. Throw in the fish, cube the sweet potato, and season it with a little curry powder and lemon juice. Ta-da dinner. We made it! Sunday is hopefully a restful day for you. A chance to take some deep breaths, spend quality time as a family, maybe have a get-together, and if you're lucky have someone else do the cooking!